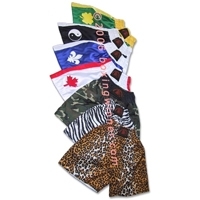 Muay Thai Shorts: We usually manufacture these shorts in nylon "Parachute" cloth for traditional muay Thai kickboxing. But on per customers demand we can also provide in satin. 4" waistband. "Muay Thai" in Thai lettering across front or any other kind of embroider art work can be done. Extra wide leg allows room for kicking. Hidden drawstring inside waistband.